The Misadventures of P.B. Winterbottom has been anxiously anticipated by many members of the Destructoid staff. I am not one of those people. Despite repeatedly hearing the name followed by words of praise or excitement, I barely gave it a second thought amidst the seemingly unending flood of games which have been releasing as of late. Now I see what all the fuss was about. Follow along and I'll give you Destructoid's review of this puzzling, paradoxical, pie-purloining game. P.B. Winterbottom is a gluttonous miscreant who desires nothing but pies. 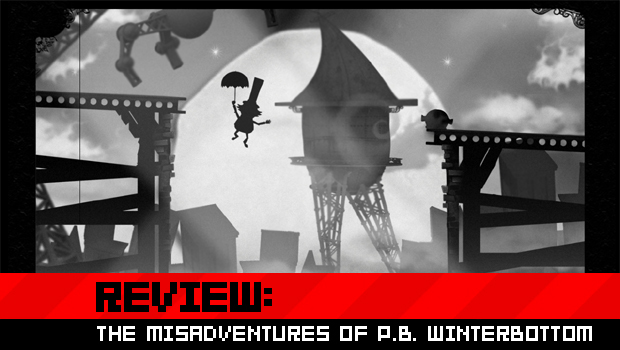 That is all the specific detail I will give on the story in The Misadventures of P.B. Winterbottom. The tale, told through a series of storybook panels, bounces along with delightfully written prose that is far too enjoyable for me to muddle with a summary. It is a cleverly constructed package from start to finish. No small part of that is the brilliant, Edward Gorey-inspired art design. All of the art is downright beautiful to look at and levels feel like paper dioramas. Both dirty yet refined, there's a simple elegance to every detail in the levels and story frames that draws you in. The game is broken into five chapters, each with ten stages. Every stage puts Winterbottom in a room containing pies which he must collect. Armed with only an umbrella and the ability to jump, the rogue can swing the umbrella to hit objects and use it to slow his descent and glide. Winterbottom has also, curiously, developed the ability to create clones of himself. These clones are created by carrying out an action while holding down a "record" button on the controller. Upon release, a blue version of Winterbottom runs the route recorded on a loop and will continue to do so unless interrupted. They're also immune to gravity, and platforms where Winterbottom may have stood need not exist when traversed by clones. They may hit objects when swinging their umbrellas -- including other clones and Winterbottom himself -- as well as collect pies. These simple abilities define the framework of the rest of the game and stages make different modifications to the rules as part of the challenge to acquire pies. The number of clones Winterbottom may have at any one time is limited, for example. As stages progress, pies have to be collected in a specific order or may only be collected by clones. Other levels restrict the area in which Winterbottom may begin recording a clone and limit the amount of time he can record. What's fantastic about the puzzles in P.B. Winterbottom is that many of them can be approached from several different angles and meet with success. Instances where you might try to record a clone collecting pies by gliding could be easier performed by smacking them into the air, but both can work. The possibilities are fantastic to experiment with. The puzzles have plenty of variety and nimbly skip from one new concept to another before anything has the opportunity to become stale. Difficulty curves may vary among players depending on how they try to approach problems. I ran into a particularly devilish one around the halfway mark that I had to sleep on, for example, but had no difficulty at all with the remainder of the game. That's because P.B. Winterbottom, again, keeps things simple. New concepts are introduced and abandoned, making little subsections of the game focusing on one idea that may not be done again in the game. This is a wise move, as it keeps stages from ever becoming over-complicated. As you play through the story mode, new puzzle challenges become unlocked. All told, there are twenty-five bonus stages of pie-collecting available to play with goals for time and number of clones used. And your scores care posted to leaderboards so you can see how you stack up globally. The Misadventures of P.B. Winterbottom is like a good pie, the kind mothers used to make. It's warm and satisfying with a near-perfect consistency throughout. It might be appealing to try and devour all at once, but trying that may leave you with a bit of an ache. No, savor it. It's likely to be one of the best damn pies you're going to enjoy this year.